I had transcended alcohol addiction and sobriety. It is not quite correct that “I” had transcended it. Transcendence happened after “I” had failed absolutely, completely. Only through the power of awareness and watching both had disappeared, in a blaze of grace never to be seen or heard of again. The first true transformation had happened in my life. It was real. It was a miracle. I was in awe and the mind still cannot comprehend, even now after 11 years, because he was left out of the loop. I mean something that was such a strong destructive habit for almost half of my life, suddenly just gone, evaporated, like it never existed from one moment to the next, suddenly waking up from a bad dream. This was a key experience. Many changes happened right after this transformation. I was filled with love and gratitude. All self-doubt, the favorite record of my mind, that it played over and over, was suddenly silenced. This was confirmation that I was not in some kind of spiritual illusion about myself, because even in all that time I had been with my master I never had an experience that confirmed that I was on the right path, never a proof, except his acceptance of me and my love and trust for him. Of course many other things happened on the emotional and mental plane but never this final proof, this dropping into another dimension this falling out of polarity. This first real transformation made all my spiritual efforts solid. My “personal” unconscious layers collapsed, and I was free of the hidden influences that had directed this life so far. I was conscious of myself as part of existence and not anymore part of Society, free of all the games society is playing, I had nothing to do with it any more, I was still in the marketplace but not of it anymore. Therefore, survival anxiety dropped away immediately, replaced by a natural trust in existence. I was loved, accepted and embraced by life, I was ultimately worthy to be alive, rooted in myself, not anymore in others. My whole life I had asked the other, the woman, the mother image to confirm me, give me worth and value, love me, or the lover, to satisfy me, give me bliss and fulfilment. But I was asking a mirror image, there was nobody in these reflections, only my own projections, nobody really there, only the reflection echoing back, asking the same from me. Just like when I look in my bathroom mirror and ask, do you love me? What will happen? Will the reflection say: Yes! No, the reflection will say “Do you love me”? There was no other! To me, this is best described by a small anecdote my beloved master has told once. I don’t recall in which discourse so I tell it as I remember it. One day just before closing time my master stopped by and asked how his day was, the butcher said he had a great day today, I sold all my meat except for this chicken here. That very moment the shop door burst open and a customer rushed in, “ahh.. glad I made it, I have some friends over today for dinner and need a chicken. The Butcher winked at my master and put the chicken on the scale, “$5 please”, he said. Now there is only one chicken. My master said there is always only one chicken. Asking for both will reveal the truth! That there is not two! Being alert, watching, looking, inquiring is asking for both. I want to elaborate on the realisation that there is only one chicken, because this is a key that can be applied to transcend any duality. And it can be used by anyone. Before the transformation of getting drunk and trying to control it I had always believed I was going in a straight line, from this point to that, from unhappiness to happiness, from addiction to sobriety, from dependence to independence. And to get there I just had to try hard enough, give it my all and one bright sunny day…it will happen. I will arrive at my final destination. I will be free, sober, happy, loved, enlightened. And when it didn’t happen, as I had hoped, the reverse attitude kicked in, no matter how hard I try I will never make it, I will be never be free, sober, happy, loved, enlightened, I am a loser. But in the struggle to be free of the drunkard I became aware that I was not going in a straight line at all, I became conscious that I was moving in a circle, going from negative to positive and then again to negative, from addict to anti-addict to addict….. From unhappiness to happiness to unhappiness, round and round…. If I follow a straight road and keep going and going I will eventually drive around the planet and arrive exactly where I am now, same with the mind. Before I was never aware of this fact, because the opposite was always hidden in the unconscious, half of the globe hidden in the dark night. The road invisible appears non-existent, that is why it looks like it is a straight line, a half circle looks like a straight line, going from dawn to dusk from here to there, the other half is dark, unconscious, hidden, but I had somehow, through watching my mind and by trying, digging myself out of myself, brought eventually light to that dark hidden part. I suddenly saw the whole mind, I stood apart, I saw the full circle not just half. I became aware that they are one whole and not 2 separate things. It is not that the mind saw that, he cannot, he is not able to look around the full circle, around the whole globe, the mind, just like the eyes, can always only see half, the front or the back, the up or the down but the eyes can never see front and back, up and down at the same time. That is the limitation of the mind and body. Only awareness can see all, not see, be all, rooted at the centre with full awareness of all that is. Being aware of that, I could not be in the illusion anymore that one day I will be fulfilled, that this mind would one day arrive at its destination, at one side and stay there, there was no destination, a circle has no end, no arrival point it just goes round and round, on and on, like the horses on a merry go round. I would never reach one side, because there is no one side, there is always 2 sides, like breathing in and breathing out, there cannot be only breathing in, or only breathing out. But the mind believes that this is possible, that is the illusion. I would never attain fulfilment in any of my desires because they are all based in duality. There was no love waiting for me at the end of the tunnel, or security, or happiness. There was always both waiting for me. Love and hate, happiness and unhappiness, life and death. Seeing this, understanding this, choice was irrelevant. I would always end up at the opposite again sooner or later. The illusion that I was going somewhere that I was growing, winning, that one day I will arrive at my goal was only an illusion, or that I will be condemned for ever, in eternal despair was also only one side of the coin. Understanding this clearly, the turning in happened, the “letting go” happened, the transformation happened, addict and anti-addict evaporated into awareness, into the heart of being. 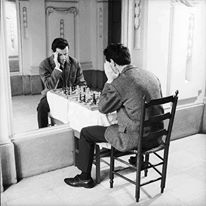 It is like a chess player suddenly becomes aware that he is actually playing against himself, his own mirror image. I became aware that I was 100% addicted to alcohol, I wanted to get drunk, escape, forget, period, and I was aware that I wanted 100% to get rid of the addiction, be free of it, period. And both identifications where mine. I was the only player in this game, I was aware of the opposite player as myself, I was my own enemy my own competitor, I competed against myself, trying to win against myself. But now the light was on, I saw who I was playing against and I knew the next move I would make because the opponent was me, myself my own mind. That day, the game of playing and winning against the world, collapsed, because it was all me, my projection. I was the world and I was the individual, because I projected “me” onto the world and the world reflected “me” back. Once a fact is known it cannot be reversed, once a child knows by experience that fire burns it will know it for life and not touch fire again. Once the mind knows 100% it is not possible to get fulfilment outside, It will cooperate and stop reaching out. All that has ever been stuffed in my mind is still intact, I still have a mind but it can not play with it anymore, the air has been let out of the balloon, it can be used perfectly for practical things but it doesn’t run the show anymore. I became a light onto myself, I could see where I was going. Now I had a centre. I was “In”. Crystallising. When this energy inside you has started an inner dance, by and by, slowly, enjoying it more and more, becoming more and more aware of it, a certain chemical crystallization happens in you. Exactly the same word was used by Gurdjieff in his work: crystallization. Your fragments fall together, you become one. A unity arises in you. In fact, for the first time you can say “I have an I.” Otherwise there were many I’s; now you have one I, a big I which controls everything. You have become your master. And the fourth step is destroying. When you have one I, then it can be destroyed; when you have many I’s, they cannot be destroyed. When your energy has become one and is centred, it can be killed, it can be completely destroyed. When it is a crowd it is difficult to destroy it. You destroy one fragment, there are a thousand other fragments. When you rush after those other fragments, the first one grows again. It is just like the way trees grow branches: you cut one, three branches sprout out of it. For me the addiction to alcohol was the catalyst that pushed me into awareness, but it can be anything that the mind is addicted to, the mind is basically in its essence addiction. Any duality can be transcended with deep inquiry and awareness. 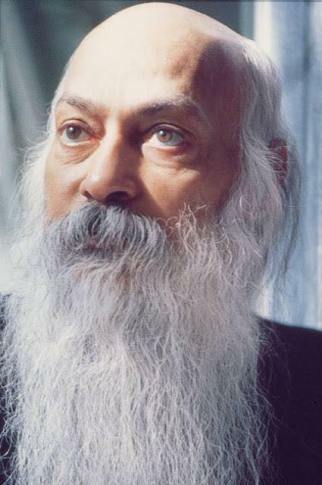 In deep gratitude to my beloved master Osho. This is an introduction to my life story, A tantric journey of transformation. You make me very happy giggling with love and thankfulness.Having Osho and people like you and many flowers what a gift, what a richness – Thank you.